Note: The survey’s pretty long. It took me about 10 minutes to complete. Click here to visit the survey site and answer their questions. 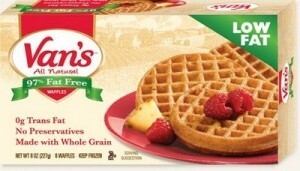 According to the Van’s Natural Foods facebook, they’ll send the first 5,000 people a coupon good for a free box of Van’s Waffles for taking the survey. It’ll ask you for your address at the end of the survey. Allow 6-8 weeks for delivery. Would love to try them. Going to work on better health! My daughter has celiacs, this is truly a coupon I cant wait to receive!